Finally on 20 September 2007 after almost 3 weeks in the Hollandes anchorage we departed to have a look at some of the other San Blas island groups. Gigi and Lulu stayed with the other Aussies, we arranged to keep in contact by radio and meet up later in September for the trip to Cartagena. Our first stop was the four tiny densely populated Carti island group less than a mile from the mainland. During the tourist season cruise ships stop at Carti so were expecting a somewhat more modern style. Not so, Kunas here live pretty much in the traditional manner. Thatched one room huts with hammocks are the standard accommodation although there is a school to year 6 and a hospital on Carti Sugup which is about 2 or 3 hundred metres in diameter and home to 600! There are no real streets, more walk paths between houses. Most houses are so close together that, in some cases, you have to walk sideways to fit between them. A few Kunas speak English and work as guides during the tourist season that kicks off in October. One such guide, Ernesto, paddled out to our boat in his Ulu with two small children. They came aboard and we chatted. When he learnt that we were Engineers he explained that there were two generators on the Island, one maintained by the government for the hospital and one owned by the community and run by the community. There was some problem with the community generation, perhaps we could take a look. Next day we took a look. Both generators were in the same building, the hospital one running away merrily, the 4 cylinder Perkins diesel driven community generator quite dead. Apparently it had been off for a month. The mechanic was summonsed to start it but no go. It turned out that there was an engine problem. With the mechanic we went through the obvious, checking fuel pump, fuel to injectors etc. All seemed OK but no go. No need for any electrical engineers yet! I am afraid we were not much help. We visited two other islands in the dingy, one in particular, although equally densely populated, was far more beautiful. Sand path walk ways had green lawn grass lining them to the wall edges of the hut and there was an abundance of flowers in the tiniest of gardens. You certainly had the feeling that the inhabitants were proud of their island. Sitting out the front of one of the huts, completely in the open, not tethered, was a small green parrot. The bird was so tame that it gent its head down so you would scratch the back of its head. From Ednbal we watched many fishermen in there dugout Ulus as well a fishermen of a different kind. There were several large Frigate birds that “stole” the catch of Terns. The Terns would dive, catch a fish and fly off only to be pursued by a Frigate or two. The Frigate would catch up to the Tern and hassle it so much, even to the extent of nipping at its tail feathers, that the Tern would drop its catch. Immediately the Frigate would swoop and catch the falling fish before it hit the water. It had been good to experience the Carti Group of Islands but the populous just wasn't for us. By early afternoon the next day we were on our way east, 5 miles to Gunboat Island. Gunboat was almost the opposite, uninhabited, although there were three Kuna huts on the island, with clear clean water. We had not swum at Carti as the Kuna toilets were small outhouses built over the water with a “straight through” system to the sea below. Even though just one small island less than 100m in diameter, the anchorage was protected by shallow reef all the way around. The first thing we saw was small Fairy Terns diving into the water that was boiling with fish. This scene was repeated almost non stop for all the daylight hours we were there. Small Tuna (looked like Bonito) were engaged in an on going feeding frenzy on the small bait fish. In the morning Kuna fishermen paddled over and cast hand lines, with small lures, into the bubbling water to catch the Tuna. They looked quite precarious, two men standing in a dugout about half a metre wide and 6 or so metres long throwing and quickly retrieving their hand lines. In reality the boats barely rocked so good was the fishermen's balance. One came to us offering the fish for sale, we bought a small, about 1kg, tuna for dinner. Next day we moved to the Los Greoullos Islands to pick up fresh fruit and veg and caught another similar size Tuna trolling a small spinning lure. 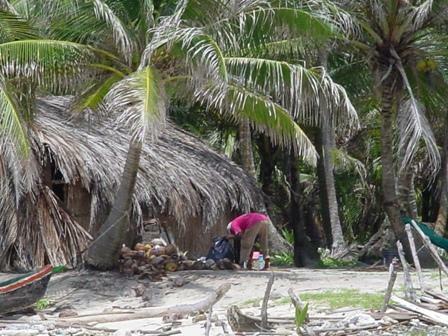 After lunch it was off to Morbedup, another small palm covered Island with two small Kuna huts housing a small family of two children 3 or 4 years old. Ashore we asked permission, largely through “sign language”, to walk around the Island. It was not a long walk, maybe 30 minutes around the whole island. From Morbid a short sail to Green Island where we saw the first cruiser since leaving the Hollandes several days ago. En-route we had been working with some of new navigation gear installed after the lightning strike. The latest was AIS (Automatic Identification System) transponder that consists of a “black box”, VHF radio antenna and GPS. The black box connects to a PC for setup then, once configured, to the chart plotter. Object of the exercise is to “see” other vessels and for others to see you via data over marine VHF radio frequencies. In configuring your AIS you put in info such as the vessel name, identification number known as the MMSI (Maritime Mobile Service Identifier) ours is 503181900, type of vessel size etc. When you are under way the AIS GPS automatically provide the dynamic information such as position, heading, SOG (speed over ground) that is added to the static vessel data and transmitted via VHF. Similarly we receive the same sort of information from other vessels within VHF range. We can have received AIS data from vessels as far as 50 miles away. AIS is mandatory for vessels over 300 tons. In time less and less large vessels pay attention to voice calls over the VHF emergency channel 16. Instead their radios alert if they are called “digitally” by another. Modern VHF, and HF, radios have a facility known as DSC (Digital Selective Calling) where you call another vessel not by voice but by punching in their MMSI number. Now, having received a vessels MMSI number via AIS one can call the vessel if there is a need to do so, collision course for example. Similar to radar, AIS can be set up to have “danger zones”. If a vessel, detected by AIS, enters the danger zone, say a 2nm radius, then an alarm is sounded to alert the skipper. Anyway, as I started to say, we had been testing AIS with our Raymarine E80 chart plotter. Sometimes it worked sometimes it did not, so investigations were ongoing. As you may imagine, with two engineers at it, there are other complications. We have other data and navigation instruments networked together to try and form an integrated safety, navigation, weather, route planning and display system. Radar and AIS are safety. We retrieve weather data via email over the HF radio. This provides wind and ocean current data for our area of sailing, currently the South West Caribbean, in a 7 day look ahead broken down into 4 hour weather forecast intervals. This is then used by our route planning software, MaxSea, along with our vessels sailing characteristics known polars that describe, in data form, our vessels performance against various wind angles and speeds, to provide “route optimisation”. So, in planning an ocean crossing from A to B you daily download the weather data (in the form of “grib files”), select a start time and MaxSea will plot your course to get you from A to B in the shortest time based on wind and current forecast along with your vessel's sailing characteristic. Neat eh. By now we were monitoring the daily grib files for a good weather window (a phrase very popular with the American cruising fraternity) for our up and coming trip to Cartagena, Columbia. Although only a relatively short trip (about 200nm) the South West Caribbean has fickle winds and some fairly strong currents. Most people we have spoken to end up motoring most of the way, taking the rhumb line route. We want to sail and if it means 3 days travelling 250nm to catch the right wind and current instead of 1 1/2 days motoring 200nm then so be it. Now where were we, yes just coming into Green Island. A bit tricky as the navigation guide states that the official charts are wrong and that many boats have ended up on the sand bar as a result. The guide gave a couple of way points that we entered into our chart plotter. As it happened the light and visibility were good so we really didn't need guide or chart, just a good pair of eyes. Next morning we had a short swim and bathed then Sasha made breakfast. As she was doing so I noticed something in the water, a 3 to 4 metre crocodile, longer than our dingy, only a couple of metres from the side of Ednbal. I called Sasha, we had just been in the water there! The croc soon dived but we saw it 3 or 4 more times during the day. We later learned the croc has been there for years and is even written about in some of the books on the San Blas. Apparently a friendly fellow, we didn’t' swim again at Green Island. Here we met another Aussie cruising couple on board Cutty Wren. The wife, Lyn, had grown up in the same suburb of Perth as me, less than a kilometre away, small world. 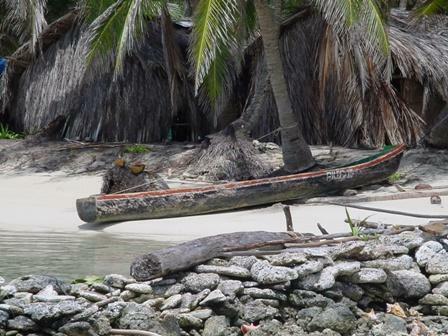 From Green Island we headed a few miles to the thriving metropolis, well dirty Kuna village on the island of Nargana. We were very low on cash (US dollars here) and there was a bank on Nargana so we could replenish to by fuel and fresh food in preparation for the last few days in the San Blas and the trip to Cartagena. However we soon found that the bank had no ATM, no credit or debit card facilities at all and would not cash a personal cheque. All we had left was $36. That went on 40lt of diesel for $35 and 20 small fresh baked Kuna bread sticks. There was an option to fly to Panama City to visit an ATM but no return until the next day. One of us could go and the other stay on the boat. It was the Swiss Banking Corporation to the rescue, a la Lulu and Gigi offered to float a loan of whatever we might need to get to Cartagena. So, with the sum total of 12 cents cash on board we headed back to the Hollandes Cays about 12nm away. En-route we anchored at the West Coco Bandero Islands to snorkel, walk one of the islands and burn our rubbish. Now that is another thing about cruising, rubbish storage and disposal. In the San Blas the Kunas are keen to take your rubbish, I understand they sort through it then throw it in the sea, plastics and all. Most cruisers, us included, sort rubbish into 3, glass and tins, aluminium cans and dry rubbish. Things like food scraps go straight over the side. Aluminium cans are given to the Kunas who sell them for recycling. Glass and tins are kept to sink at sea when you are in deep water, over a couple of hundred meters and the dry, paper, plastic etc is burned. There is no waste collection facility in the San Blas! On Saturday 29 September we motored, into the wind again, for West Hollandes to prepare for the trip to Cartagena. I installed the post lightning new LED navigation lights at the bow and stern while Sasha downloaded the latest grib weather data, carried out route optimisation and downloaded the route data from the laptop to the chart plotter. In the evening we had a small farewell party on board another Aussie's boat, Peter's 60ft charter yacht Golden Eagle, with Aussies, Alan and Dee as well as Gigi and Lulu. Not too much drinking before the trip! Just after 9am on 1 October 2007 Roi Soleil and Ednbal upped anchors and headed out of the San Blas for the Caribbean Sea and Cartagena Columbia. With very little wind we motored the first 3 hours until we were out past the Islands and heading North East to catch the forecast favourable current and winds. We didn't have to wait long as squall came over us with winds 20kn off the quarter, we were away but very wet and very little visibility. We had the fishing line in and hooked 3 fish but lost them. One was huge and silver, as big as a person, that really made the reel scream as it hit a great summersault in the air. We noticed something out the back of the boat that turned out to be a big palm frond caught around the keel. Had to back up to get it off. The wind dropped off late afternoon so we motored in the rain for another hour or so before it sprung up again from the South West and we sailed comfortably with the wind off the aft starboard quarter for most of the night with 3 passengers. At evening two swallows took up roosting, first on the companionway then on a line we have strung under the bimini. When we were at the wheel they were only 20 or 30cm from our heads. Another small black seabird took up residence on one of the sail lines just in front of the dodger. Once it was light they left us on what turned out to be a gorgeous day, what a contrast to the day before. By now, half way, we had the current with us the wind initially abeam starboard. 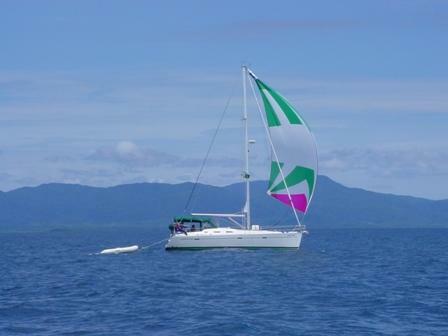 Later it backed and we able to set the spinnaker, doing 6 to 7kn SOG with a breeze of 12 to 15kn at about 120 degrees. We found that the “wind vane” mode of the autopilot worked a treat. In wind vane mode the autopilot maintains a constant wind angle so the spinnaker stayed set all by itself, magic! Sasha had spent the previous afternoon slaving away in the galley making party pies so we had beautiful meat, mushroom, onion and ginger pies to snack on during the night and morning, scrumptious.